This newsletter can be downloaded for printing – please click here. After yet more consultation with the Planning Department et al. we have agreed final plans with the architects and these will form the planning application that will be submitted shortly. To say that the PMG is holding its collective breath would be an understatement. 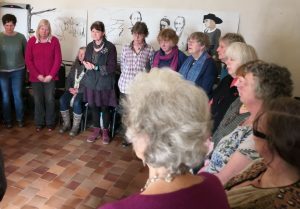 Meanwhile a lot of planning of events has happened and we now have a fairly full program for 2019, which demonstrates our aim to offer a diverse range of enriching activities, both spiritual and cultural, in our unique setting – full details at the bottom of the Newsletter. We are particularly delighted to announce that the Klezmonauts will be performing at our Summer Concert. John Senior will be on hand to explain how Mahler fits in to their music. Taizé at the Pales – a day exploring and singing – March 17th. 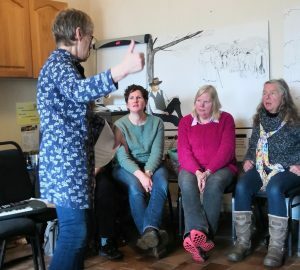 Susie Ennals writes – 19 people braved the wild windy weather on Saturday 17th March to come to the Pales for a day exploring the music and spiritual messages from the village of Taizé, in France. Angela Coleridge, who has visited Taizé on a number of occasions with her husband Peter, described how the community began, as the inspiration of Brother Roger, in 1944. She told us about his principles and beliefs, and read many quotations from his writings. Interspersed between thesections of Angela’s input, Susie Ennals taught the group 7 songs and chants from the Taizé tradition, most of them in 4 parts. The singing was beautiful! 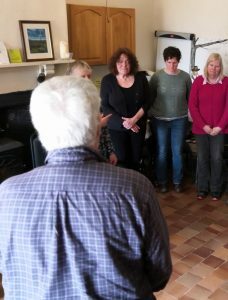 At 2.50pm, after a shared lunch, the singers moved into the meeting room and sang three of the songs into silence, at the start of the meeting for worship. It was a very moving day. John Senior writes – We are all aware of the damage that carbon dioxide emissions are doing to the environment, but what technologies could address the problem? The Pales Eco Engineering Day will be an opportunity to learn about two approaches, and to question technical experts. 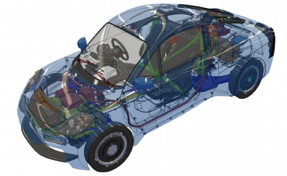 The morning session will be a presentation on the Rasa revolutionary hydrogen-fuelled car, which is currently undergoing road trials. No heavy battery, but instead a hydrogen fuel cell and regenerative braking on all four wheels, with energy stored in capacitors. The Rasa, designed by Riversimple engineers here in Llandrindod Wells, will be available for inspection during the lunch break. In the afternoon two specialists from the Centre for Alternative Technology in Machynlleth will tell us about ecologically friendly systems for domestic heating and insulation, including the pros and cons of ground-source heat pumps. Many of us are concerned about the cost and ecological impact of the various heating and insulating systems on the market – here is your opportunity to quiz the experts. The poetry day will be led by Trish Munn and Linda Murray-Hale. Trish is a poet who especially enjoys contact with the natural world and all the creatures in it. Linda has taught English Literature for many years and has a great love of poetry. The aim of the day is to enjoy reading, exploring and discussing what is universal in the theme of Death in poetry. A suggestion would be that we think about death in broad terms, so for example we could include poems of the natural world in autumn, and all aspects of what death might mean to you. There are no hard and fast rules, and if this theme doesn’t appeal then feel free to choose another. We’ll begin the day with some ‘warm up’ exercises to get us in the mood. Bring favourite poems on Death, or of your own choosing to read, using these as an initial stimulus. Also please bring an object with you (nothing too huge!) which will be used in one of the ‘warm ups’. The object need not pertain to the theme, but will be something that has meaning for you. There’s no need to have written poetry before. This is an informal day that we hope will be fun, and just to see what happens when we play with words. Friends of the Pales fundraising. FotP, as you may be aware, is designed to help with current running costs in preparation for our major development plans. To be able to demonstrate existing support is a great advantage when appealing for funds. Following distribution of the FotP appeal in Southern Marches, details have been distributed to Welsh Area Meetings at the Meeting of Friends in Wales. We hope that our Friends in our areas of Wales districts will support our endeavours both prayerfully and financially. Our next step will be to contact Meetings in England close to the Southern Marches and then to spread the appeal wider in England, Scotland and Northern Ireland. The following have been arranged and others are being planned for later in the year. Poetry day – Trish Munn – for booking please click here. Ecology Day – Jeff Beatty – for booking please click here. Art Days (proposed charges £50 for three days or £20 per day) – booking details available soon. One of the proposals for the Pales is to place shepherd’s huts in the wooded area near the entrance to the car park. This led the PMG to investigate areas that are not visited often. The coppicing that was carried out last year has opened up the woodland and has revealed the pasta trees that were planted back when the Martins developed the garden. 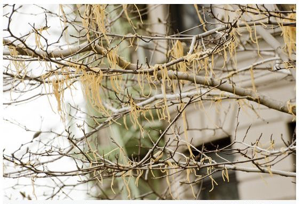 The spaghetti tree looks as if it will bear good crop this year but the tagliatelle is looking a little flat. How’s the lasagne bush coming along? I am very aware how hard the Pales group is working to fund this lovely Meeting House. I hope that the fund raising from Friends will be able to support it but if it does not maybe other sorces could be considered. Pales is in the centre of some impressive walking paths. Maybe walking groups would support it if it could act as a resting place for walkers trecking around the area? It could be a place to stop and eat packed lunches with water and toilets available. It could be a place where walkers could set up their tents for the night. It would be a haven for walkers and be a way to highlight, respond to and encourage walking as well.